Uraccen is a Breton witchblade held prisoner in Cidhna Mine. 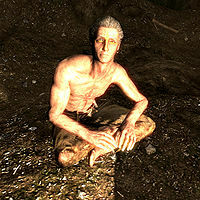 He has been sentenced to life in prison for being a member of the Forsworn. He is the father of Uaile, an undercover Forsworn agent. Nothing. I'm innocent. "Innocent? So was I, for the first one. The other murders were all me, though." Theft. (no bounty) "Petty thieving, huh? Just like poor Grisvar. Hopefully you'll learn your lesson faster than he has." Assault. (bounty = 1-999) "Violent one, huh? Best keep that to yourself, new blood. Others find out, they'll consider that a challenge." Killing a guy who asked too many questions. Regardless of your response, he will then go on with: "My advice? Serve your time at the pickaxe and get out. You don't want to end up getting a shiv in the guts over a bottle of Skooma." You can then ask him what Skooma is, and he'll explain: "Bottles of Moon Sugar. Khajiit use it as a... pick me up. Good way to pass the time. Prisoners smuggle the stuff in. Only currency we have down here." Asking him about what exactly a shiv is will cause him to elaborate: "Small blade. Easy to hide. I mean, sure, you could just swing a pickaxe into someone's face, but people tend to see that coming. Got a problem with a prisoner? Get a shiv. Hear Grisvar has a spare, if you could get him to part with it." Upon asking where the guards are, he'll reveal: "They come in here once a week to clean out the bodies, grab any ore we've mined, and beat down the troublemakers. That's the only time when we get food, too. And if there's not enough ore mined up, we don't get any." You can in turn ask him what he's in for, and he'll claim: "A Nord nobleman I served was stabbed in the night. Wasn't me, but I knew I'd be blamed. So I ran. Joined the Forsworn. Started killing. Got caught. Now I'm here." If you ask him why he joined the Forsworn, he'll show disdain for the Nords: "Because life was better under the old ways. No Nords and their laws." and will continue with: "One day, the Forsworn will paint the walls of Markarth in their blood. ", or, if you're a Nord yourself, he'll add: "One day, the Forsworn will paint the walls of Markarth in your kinsmen's blood. Best you not be there on that day, Nord." When you ask him where to find Madanach, he'll show you sympathy: "If you're asking, that means you're the new lifer. Tough luck, friend. Those guards sold you out but good. No one talks to Madanach, I'm afraid. Not without getting past Borkul the Beast... And you don't want to talk to Borkul the Beast." He'll tell you about Borkul if you ask: "Madanach's guard. Big, even for an Orc. Heard he ripped a man's arm off and beat him to death with it. He's old-fashioned like that." Consequently, he'll greet you with: "I left behind my daughter Uaile when I was taken. ", "How old is my daughter now, I wonder? In prison, you lose track of time. ", and "I'm just another Forsworn sent to rot here in this mine." If you decided to escape with Madanach, Uraccen cannot be talked to and will only say: "No turning back now." This page was last modified on 5 February 2017, at 20:17.